The Beehive has been labelled ugly. According to a website called virtualtourist.com (which is probably trying to make its name with a headline grabber) the Beehive is the third ugliest building in the world. The less than endearing description of the Beehive from the site is ‘a slide projector that fell on a wedding cake that fell on a waterwheel’. It’s true that, by itself, the Beehive (the executive wing of parliament) looks odd. It looks even odder when seen next to the other parliamentary buildings. To its left is the modern, Bowen House. To its right is the early 20th-century Edwardian neo-classical Parliament House (which was never finished to its original plan), and to the right of that, the 1899 Victorian neo-gothic Parliamentary Library. An odder collection of sibling buildings would be hard to find. According to Te Ara’s Government and nation entry, these oddly contrasting buildings are an illustration of the casual, haphazard development of both the parliamentary buildings and New Zealand’s system of government. But, despite the oddity, is odd the same as ugly? Sir Basil Spence was a world renowned British architect who designed the Beehive, and supposedly gave it its name based on a box of beehive brand matches given to him. Internally, the Beehive has some beautiful finishing including Tākaka marble and Tawa panelling. Externally, it is a tourist attraction that is absolutely unique. As has been noted about the Beehive and its sibling buildings: ‘people love them or hate them’. Myself, I love the Beehive. What do you think? Is it ugly or unique? I like the Beehive as a piece of design. At least it’s interesting and has a distinctive shape unlike buildings such as Te Papa. I feel sorry for the poor beehive – it looks quite cheerful in its rotundness compared to some of the other finalists. Who cares whether some people think it’s ugly? Architecture and aesthetics are truly matters of opinion. The Beehive stands out from the architectural crowd and is remembered when others are forgotten. Virtual Tourist seems out to get modern/modernist buildings – they are much easier targets than older buildings laden with frills and fancy fretwork. I have to say, I was kind of proud our little Beehive was so high on the list – it means they know it exists. The Beehive is a crazy building (as anyone who has experienced the disorientation of getting out of one the lifts an ending up in a circle with no obvious exit will agree), and kind of ‘dumpy’, but definitely not ugly. I walk through parliament grounds every day. I constantly have to weave through tourists taking pictures of the beehive. In fact I don’t doubt I feature in many pictures of the beehive, skulking past the happy tourist on my way to work. I think even on a list of ugliest buildings just in New Zealand, the beehive wouldn’t be in the top 10. Virtual tourist obviously didn’t travel around much in New Zealand. Te Papa didn’t make the list? Have people seen this building in Wanganui? From an aesthetic point of view, I would have preferred Parliament House had been completed to its original 1910s design. What we have now is two assymetrical buildings (the Library and Parliament House) and the out-of-scale, Beehive at the end. 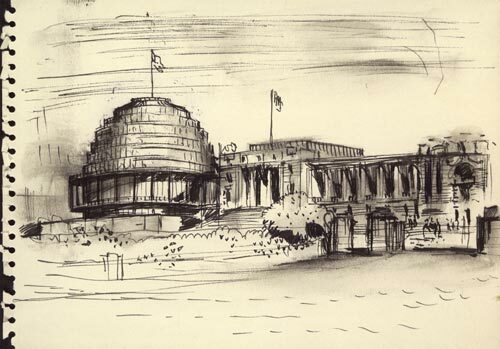 I understand Prime Minister Keith Holyoake was keen to see Parliament House completed, but in the era of cultural cringe the Ministry of Works fell for the design of the ubiquitous overseas expert – Basil Spence. But things could have been worse. One plan I’ve seen involved the demolition of Parliament House and Library and their replacement with Beehive-styled buildings. Perhaps if that had happened we might have led the list of world’s ugliest buildings – gold rather than bronze! Brilliant building to work in, if a little confusing at times. Unlike most office buildings, it has windows that OPEN, a rarity in Wellington offices! kia ora. As I understand, the list was entered and voted on by members of VT as well as staff. Odd and ugly are not synonymous, but the view of parliament shows that buildings can be both. As I recall, the main building was the SECOND place getter in a design competition, the winning entry having been disqualified on a technicality. It might have looked better if finished to the symmetrical scheme as originally intended. I also understand that the Basil Spence design was originally planned for a different client, who was smart enough to reject it outright. But I thought it was the Prime Minister between Rowling and Lange (may his name fall from the records!) who was the dupe who bought the Spence design. Sorry guys – No it was Keith Holyoake who fell for Basil’s Spence’s little conjuring trick. Different PM, same shambles. That’s right Reg, it was Keith Holyoake. According to our entry on the Wellington region, ‘In the 1960s the government decided to complete Parliament House… Prime Minister Keith Holyoake had wanted to complete the original plan, but the government architect persuaded him to put up a modern building.” Perhaps PM Holyoake was caught by a case of ‘Yes, Minister’. I note that some wag has edited the Wikipedia article on The Beehive to say, “The Beehive was built in stages between 1969 and 1979 but during this period it burnt down by a serial arsonist…” Wishful thinking, maybe. It’s a bit like the Sydney Opera House. Hated at first by Australians who later came to realise that its very oddity made the world take notice and now they are proud of it. The beehive is not liked by all New Zealanders but most tourists think it’s great. Something different and out of the ordinary. Something of New Zealand. Personally, I would have called it the Dalek which it more resembles. The only ugly bit of parliament is Bowen House which is just yet another modern block which could be anywhere in the world. (I was a visitor – now come back to stay).